Turn off the projector and allow it to cool down. The filter is located on the side of the projector that has the lamp. As you face the whiteboard it is on the right side of the projector. Slide the filter out, as shown. This allows both sides of the filter to be cleaned. mouth – blow VERY, VERY hard!! DO NOT USE WATER to clean the filter! Use a yard stick to press the power button to see if it will turn on. The power cord may be disconnected from the back of the projector. Check it. If the Lamp and Temp buttons are both blinking red, call the Help Desk! Use a yard stick to press the power button. Call the Help Desk to remotely turn off the projector. 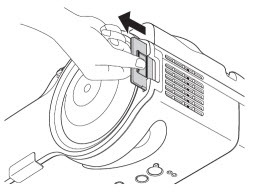 If it cannot be remotely tuned off, unplug the power cord from the back of the projector. Overheating may cause the projector to not turn off. Once the projector has been turned off allow it to cool down and then clean the filter. If it still doesn’t work correctly, turn in a tech help request. Pressing the A/V Mute button on the remote control turns off the image and sound and darkens your screen. To turn the image and sound back on, press the button again. If this happens a lot, then you could possibly be holding the AV Mute button for five seconds or more. This causes the projection setting to change from Front/Ceiling to Front which makes the screen appear upside down. Hold the AV Mute button for five seconds to see if the screen returns to normal. (See Image 3) If your desktop image is still upside down, follow the steps below to correct it. Use the down arrow to select the Extended menu. Use the down arrow to select Projection and press Enter. You must reset the lamp timer after replacing the lamp. Select the Reset Lamp Hours. Press Enter. You will see a confirmation screen.